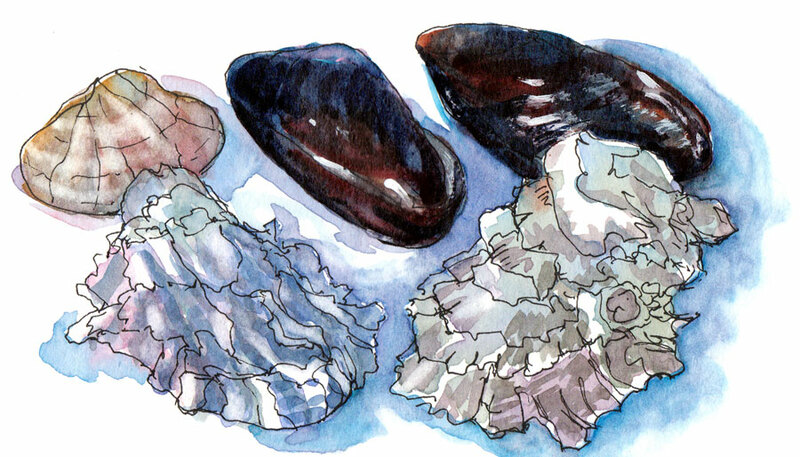 Shellfish Shells, original version, ink & watercolor, 5x8"
A shellfish company saw a previous shell painting of mine and commissioned me to paint one for them to use as a background on their business cards. They shipped me a box of their oyster, clam and mussel shells to use as reference. I created the above sketch in my Moleskine watercolor notebook and sent them the file for their review. On the next page in my Moleskine, I sketched a landscape and painted it with juicy washes, something I do on the 140 lb watercolor paper in my hand-bound sketchbooks all the time. Without my noticing, the water seeped through the lighter-weight Moleskine paper, wetting the shell painting on the previous page. Some of the mussels’ paint lifted, creating the wonderful texture (close up above) that I probably couldn’t have achieved if I had I tried. The only downside to this “technique” is that some of the lifted paint printed on the opposite (fortunately blank) page. I wasn’t worried about the change in the art for my client because I’d already created a high-resolution file of the original. And as it turned out, they asked me to do another version with two different kinds of oyster shells and more clams, apologizing for changing their directions. 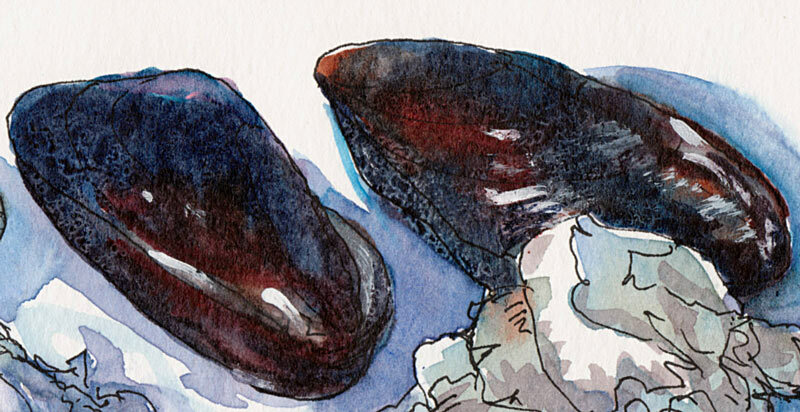 I’m happy to paint as many versions as it takes since shells are one of my favorite subjects. Kathryn is right, that texture is unbelievably beautiful–and it’s magical how it happened. Your watercolors are beautiful. I love your “Accidental Watercolors” the colors are unique to your painting! Wow! What a cool unpredictable result! Congratulations on the commission!!! That must be fun for you! I always enjoy such serendipitous happenings in art. There are always new discoveries. Lovely watercolour! Wow! Congratulations on the commission! Those mussel shells are delicious, so rich and dimensional. Beautiful drawing and nice story about a happy accident!